PRODUCT: 1 inch wide Natural Bristle Paint Brush / Chip Brush / Pastry Brush. Set in wood handle. 36/Box. Price/Box. Features 100% natural undyed taper cut bristles. Securely locked in epoxy cement and plain wood handles. Bristles are tapered and neatly cut for accurate coating application. Inexpensive brush useful in all fields. Recommended for applications using petroleum or solvent based materials and roofing tars. Other Applications: pastry brush, dusting brush, roof coating brush, dustless brush. Can be washed and reused many times. 1 inch wide Natural Bristle Paint Brush / Chip Brush / Pastry Brush. Set in wood handle. Price/Brush. 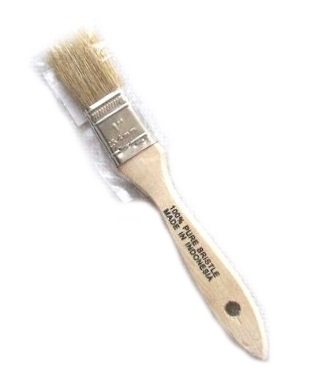 1/2 inch wide x 1/4 thick Natural Bristle Paint Brush / Chip Brush / Pastry Brush. Set in wood handle. 36/Box. Price/Box. 1-1/2 inch wide x 5/16 thick Natural Bristle Paint Brush / Chip Brush / Pastry Brush. Set in wood handle. 36/Box. Price/Box. 2 inch wide x 5/16 thick Natural Bristle Paint Brush / Chip Brush / Pastry Brush. Set in wood handle. 24/Case. Price/Case.